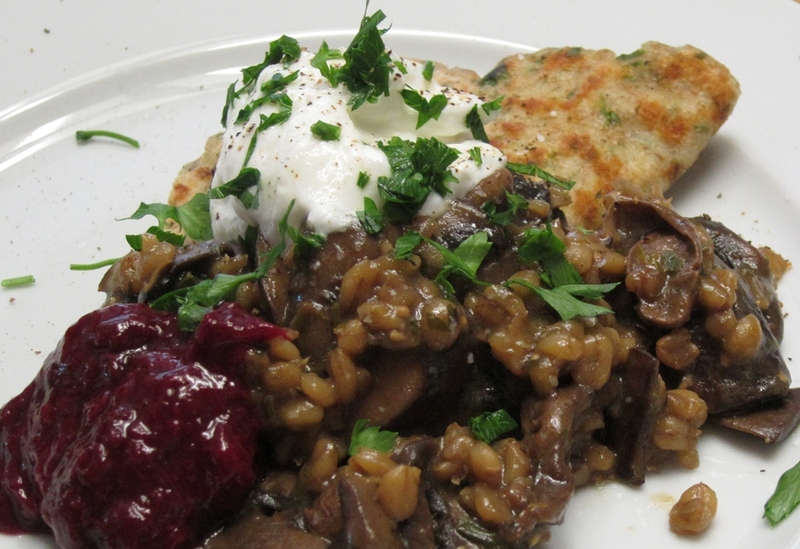 This delicious vegetarian dish comes from Yotam Ottolenghi’s book Plenty. The chef is much better known in the UK where he runs a chain of “deli” shops that serve a huge variety of creative dishes, both vegetarian and non-vegetarian. He also has a weekly column in the Guardian newspaper. The website has a lot of his recipes and the book is actually a collection of these recipes. Plenty has quickly become one of my favorite books for recipes and inspiration. All recipes are vegetarian, very creative and full of Mediterranean (mostly) and exotic flavors. 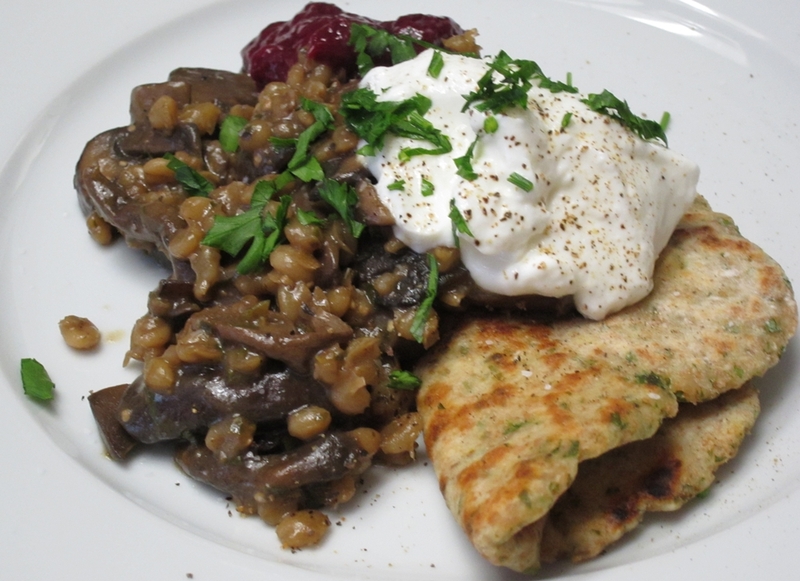 This dish combines a rich stew of barley and mushrooms with quick flatbreads made with yogurt. The dish is topped with Greek yogurt and -my addition- sour plum paste. The barley mushroom stew is done by separately cooking the barley in plenty of water until tender but still a little chewy. Then I cooked a bunch of fresh mushrooms (brown, white button) with a handful of soaked porcini mushrooms and their soaking water. To that we add thyme and white wine and let the whole mixture cook and meld. Then the barley is tossed in along with chopped parsley, lemon zest and lemon juice. 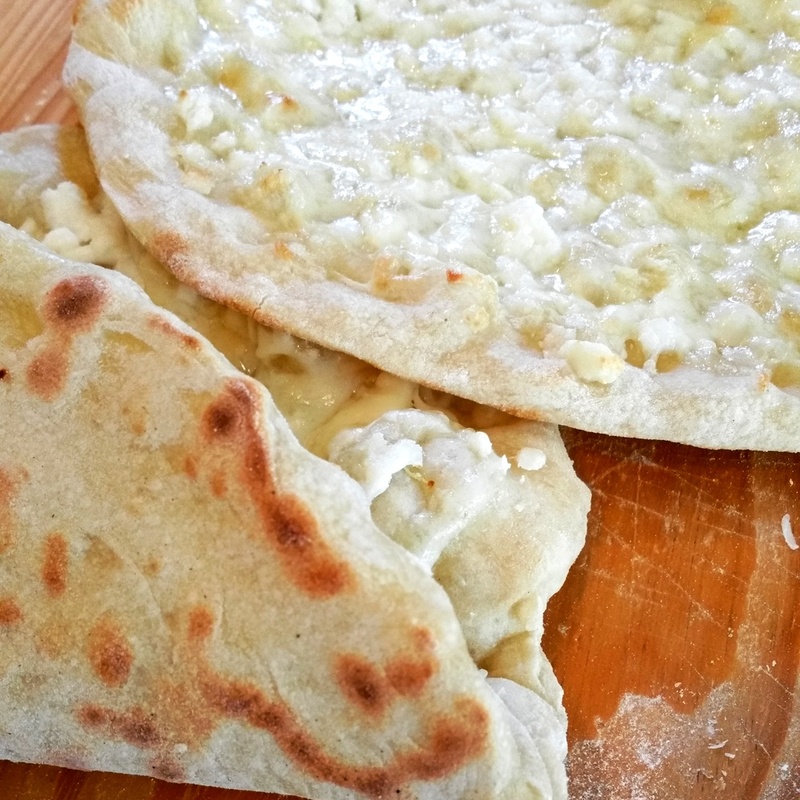 The flat breads are done from start to finish in about an hour. 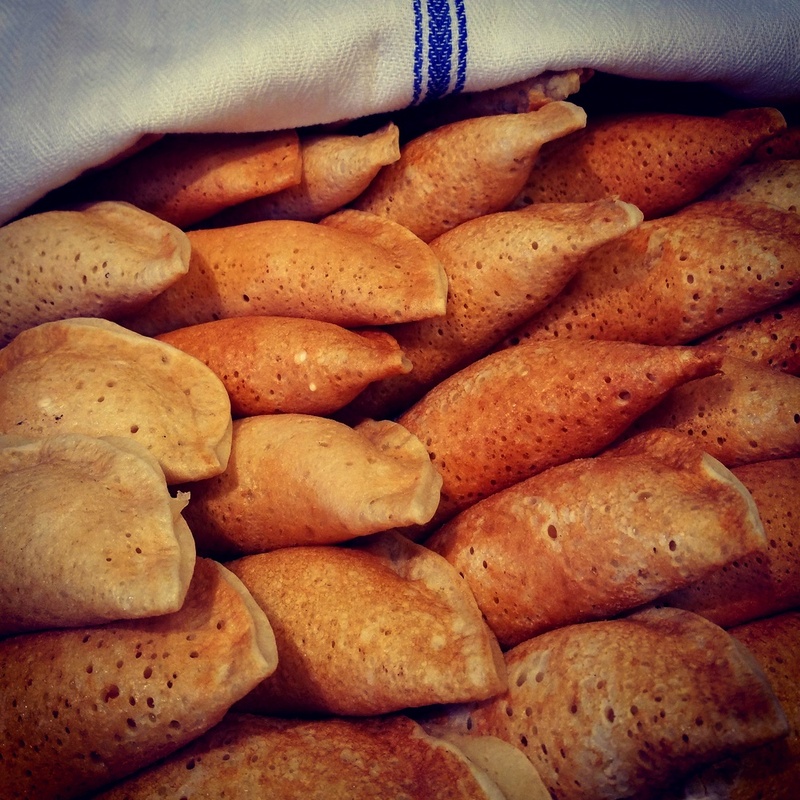 The dough is a quick bread, meaning it is not a proofed bread dough with yeast. Instead it uses a chemical leavening agent, specifically baking powder. 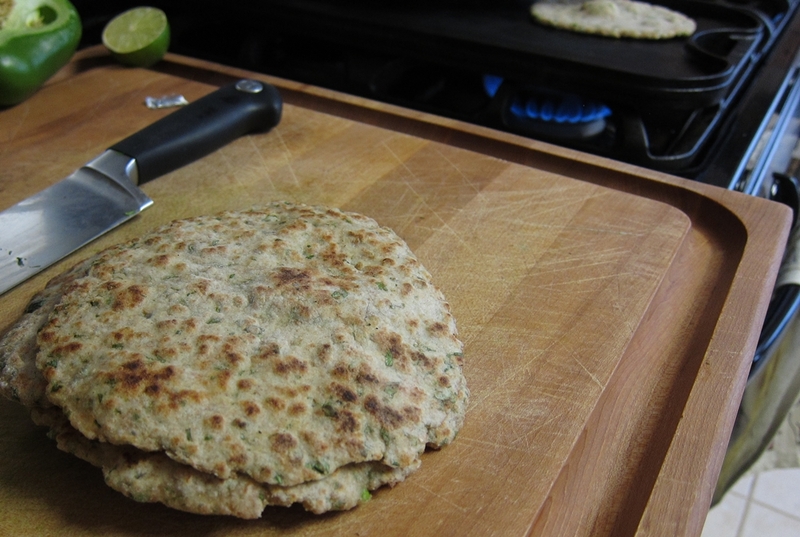 The dough consists of whole wheat and white flour and is flavored with a little chopped cilantro. After leaving it to “rest” for 30-40 minutes, I divided it up into 6 pieces and rolled them into rough circles. I cooked those on my cast iron griddle using a little clarified butter. After plating the bread and the barley-mushroom stew I topped it with a heaping spoon of Greek yogurt and that aforementioned plum paste. 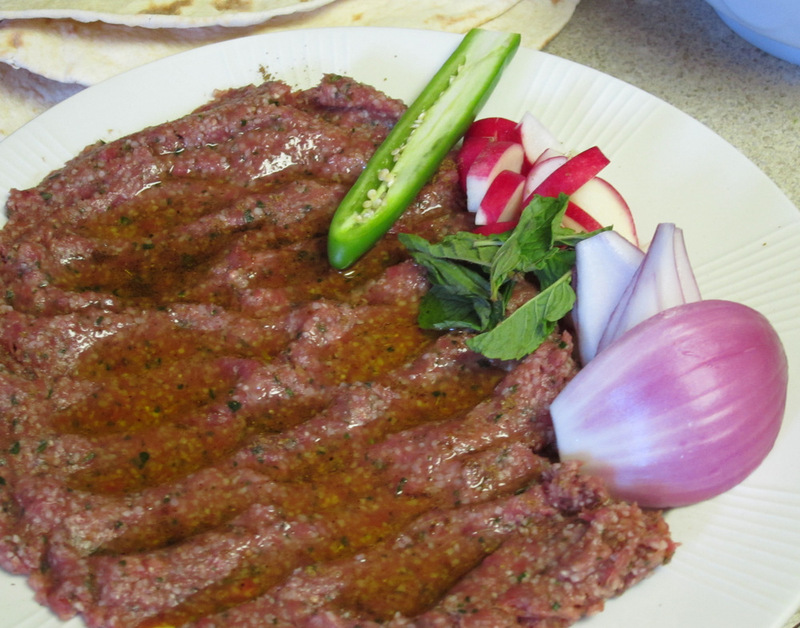 The paste is such a unique and delicious condiment from Barbara Massaad’s book about Lebanese traditional Mouneh. I bought her book when I was in Lebanon a month ago and it is really an amazing piece of work filled with Lebanese pantry items, preserves, pickles, fermented and dried items. It’s the type of regional food that all grandmothers used to put up for winter and some still do. It’s great that Barbara went through the painstaking trouble of recording these procedures and recipes. 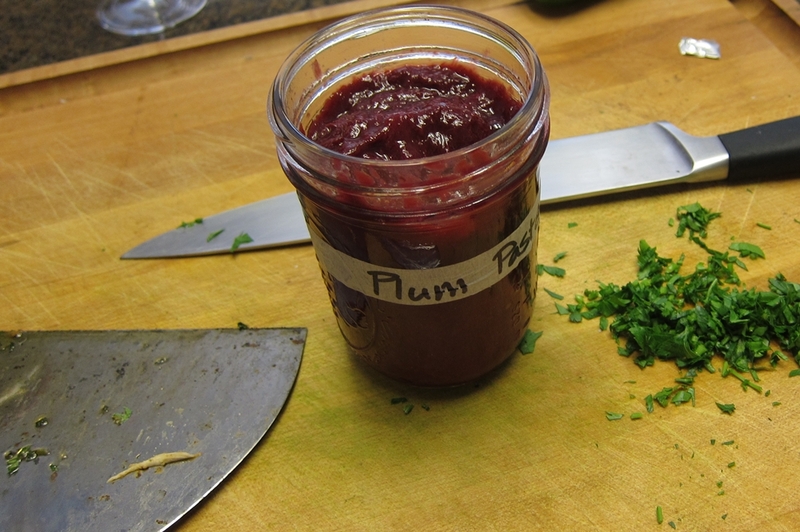 This is the first recipe I’ve tried from it just because it looked interesting and new to me and because there are a bunch of plums in the market now. It’s really the equivalent of tomato paste but made with plums that are cooked down with nothing more than salt. The taste is tart, fruity and deep. 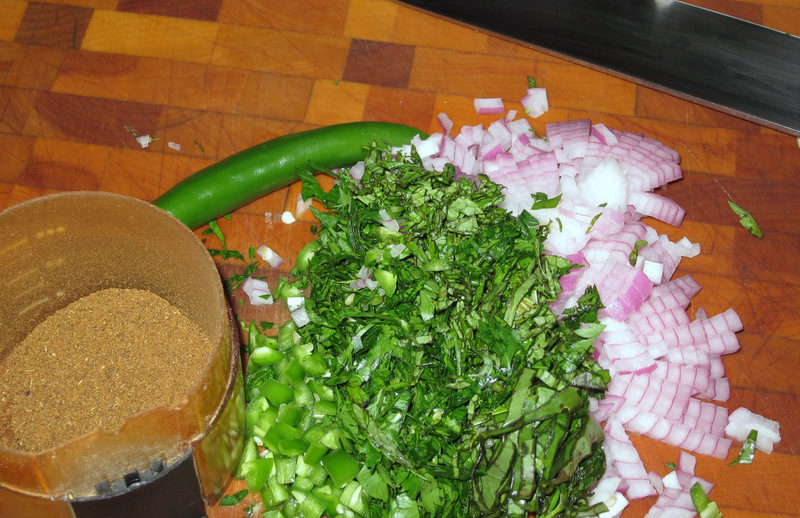 It was great on top of this dish and I’m sure it will add an excellent dimension to meat stews and vegetable dishes. 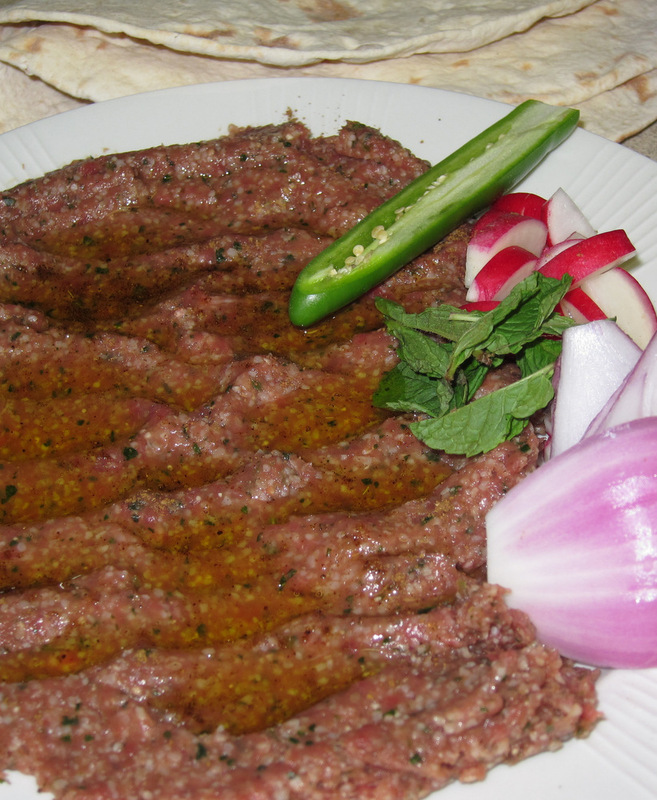 It might not look like it, but this dish’s inspiration and flavor is Lebanese. 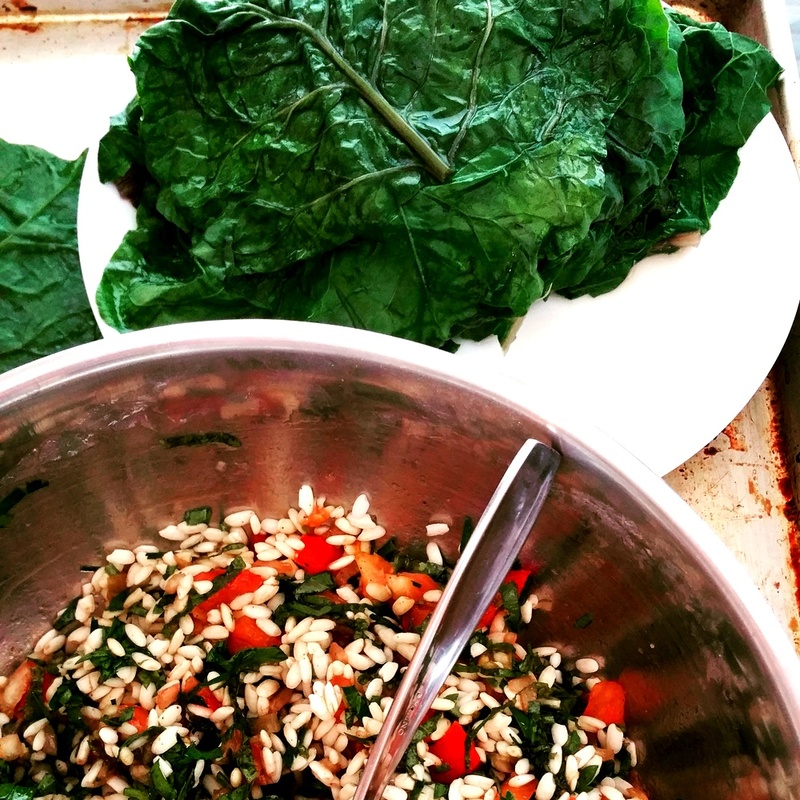 I love swiss chard ribs, those central stalks in each leaf that usually get thrown away. My mom always quickly boils them and tosses them with tahini, garlic and lemon juice. I was eating some of those recently and wanted to make them part of a more substantial plate. Lamb came to mind first, but Diana is not crazy about lamb. So, beef was my other option and short beef ribs seemed like they would work best with the chard ribs. 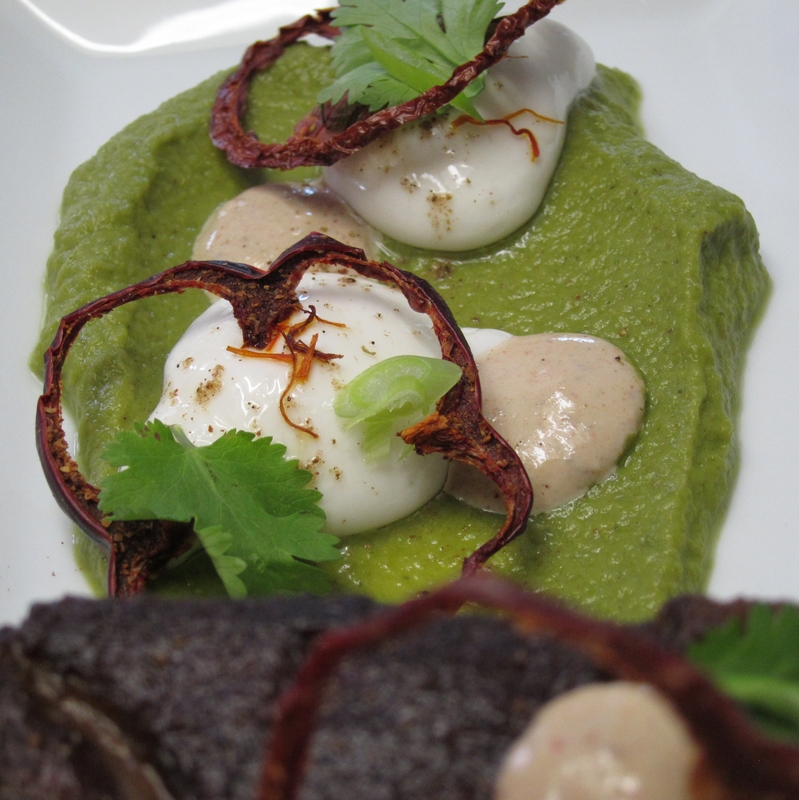 The eggplant and yogurt made sense as natural companions flavor and theme-wise. 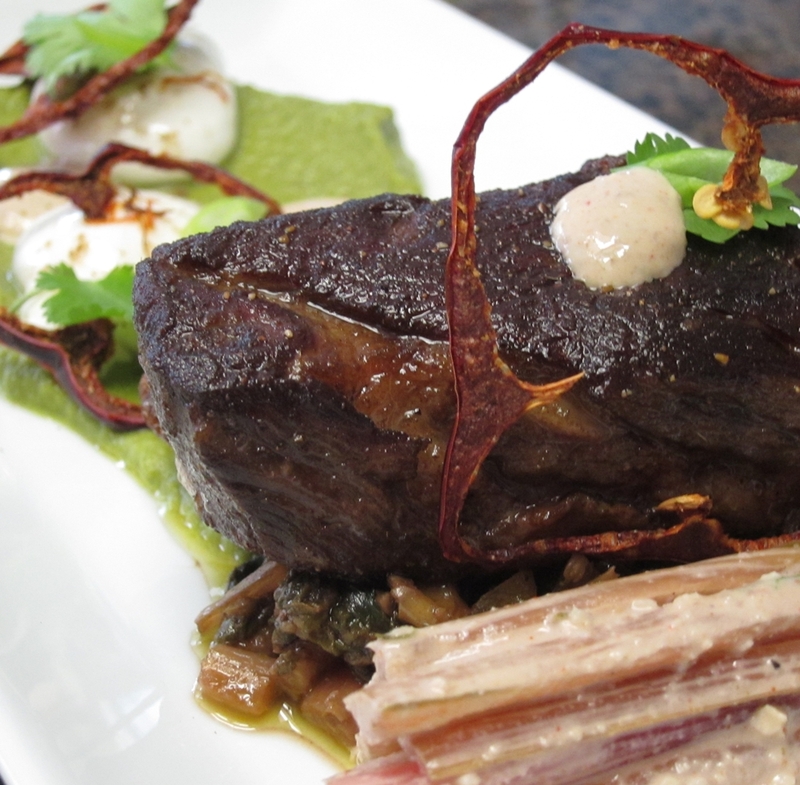 The beef ribs were cooked sous vide for 72 hours. They were tender but not mushy or falling apart. Before serving them, I browned them in some heavily seasoned clarified butter. In Lebanese cooking Samneh is the name for clarified butter and it is used extensively as both a cooking medium and for flavoring. 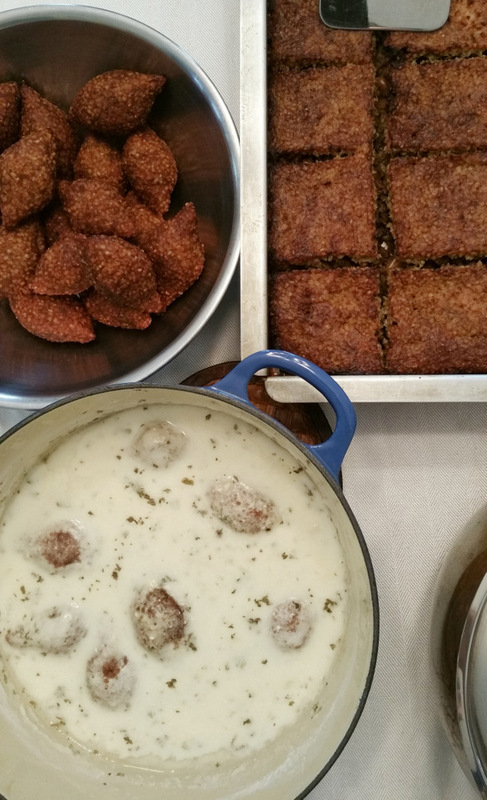 To season it I used a spice mix that I get from my grandmother every time I am in Lebanon. I usually pick up a good size bag of the mix and store it in the freezer. It’s made form a mixture of whole spices and herbs including allspice, marjoram, anise, rose buds, cinnamon and a few other varieties. 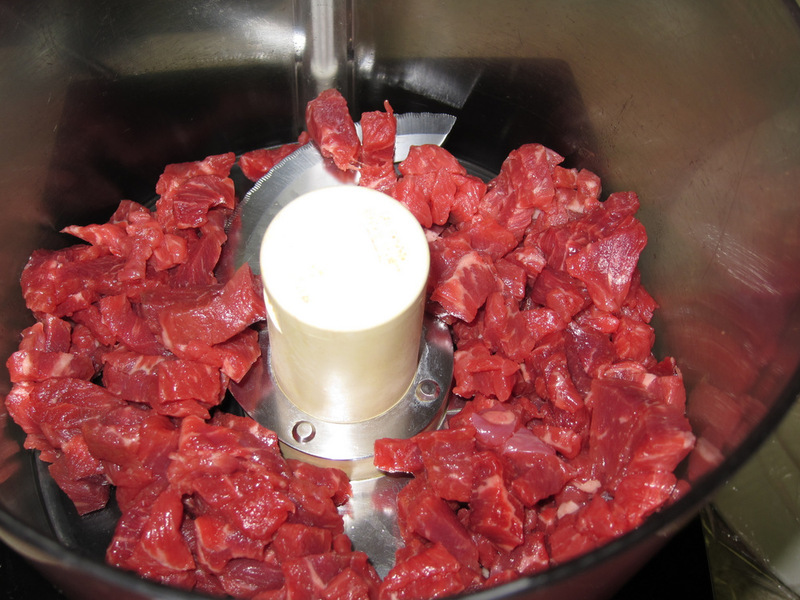 Typically, I just grind as much as I need in the spice grinder. I melted the clarified butter and added a couple of large pinches of the ground spice mixture. That warmed and heated up a bit before the fully cooked boneless ribs went in for a nice spiced butter bath. 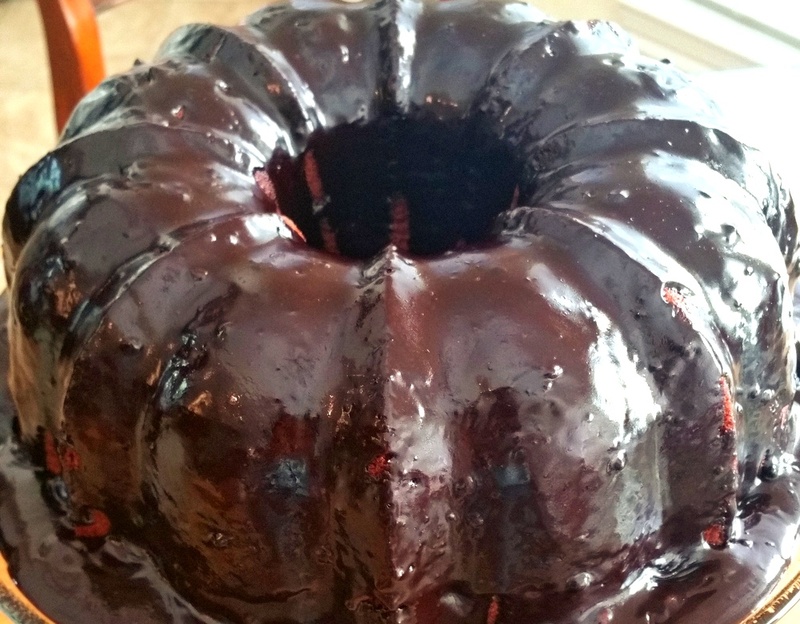 That also helped them get a very attractive dark mahogany color in addition to a spectacular exotic flavor. I used swiss chard in two forms here, the sauced whole ribs and a ragout made from the ribs and leaves. 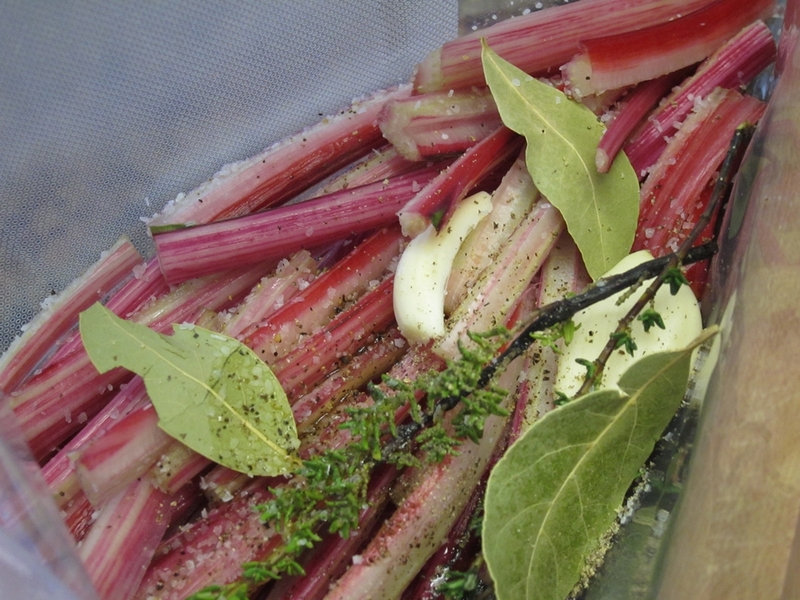 I was hoping to retain the nice red color that red swiss chard ribs have so instead of boiling them as is typical, I cooked them sous vide in a pouch with herbs, garlic and a little olive oil. Unfortunately, it seems that the red color is not just water-soluble, but also not very heat-stable. The ribs ended up losing most of that color when cooked. I selected most of the nice looking ribs and left them whole, the rest got diced up to use in the ragout. The whole ribs were dressed with a walnut-tahini sauce. The sauce is just an update of the classic tahini+garlic+lemon juice+cumin with the addition of finely chopped walnuts. It worked very well with every component on the plate. For the ragout of chard, I diced the rest of the cooked ribs and chopped the blanched leaves. I then cooked these with plenty of shallots and chopped walnuts in clarified butter. I tossed in a few sliced dried apricot and seasoned the mixture with black pepper and pomegranate molasses. It ended up delicious, with a good peppery kick, sweet-tart flavor and a touch of bitterness. This combination went great with the rich beef ribs. 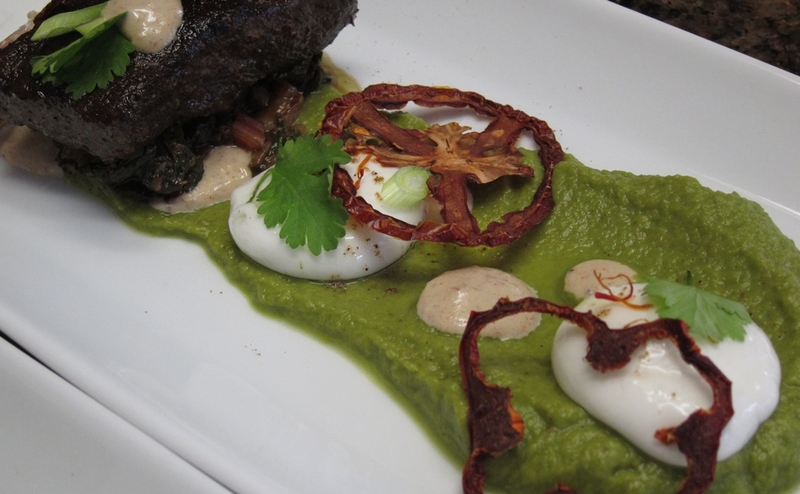 The eggplant is based on a traditional Lebanese eggplant puree called mtabal. Typically, like it’s close cousin Babba Ghanouj, is made from eggplant that is cooked over charcoal in its skin until that turns black and charred. 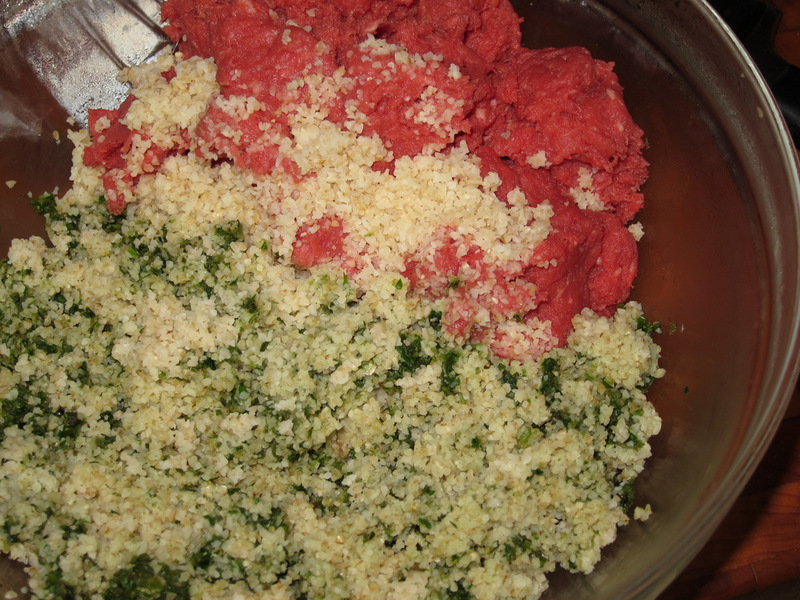 It is then peeled and pureed with flavorings that include garlic, lemon juice, cumin and in the case of Babba Ghanouj tahini sauce. I wanted something a bit more refined for this so I opted to cook the eggplant (I used the slender Japanese type) sous vide along with olive oil, grated ginger, salt, Aleppo pepper and a little water. When completely soft, I pureed the eggplant and it’s cooking liquid with a bunch of blanched cilantro and a small handful of blanched parsley. Last minute adjustments included the addition of some Meyer lemon olive oil, smoked paprika and lemon juice. 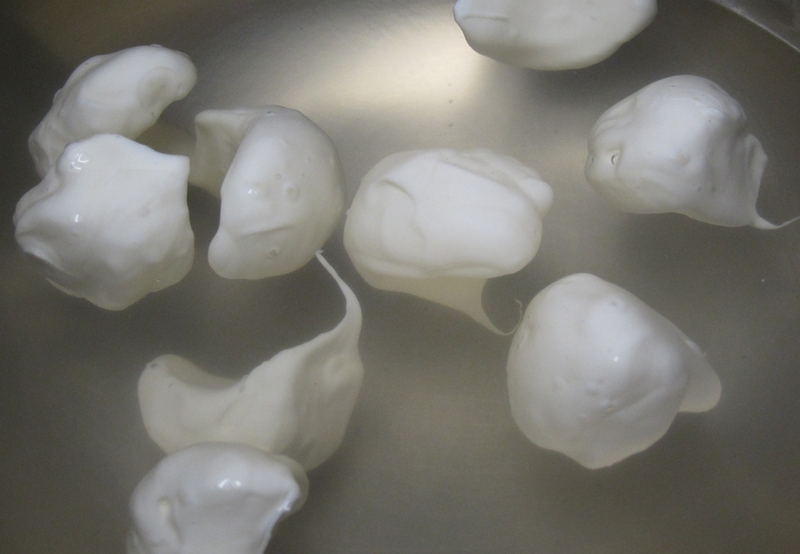 The yogurt dumplings are a variation on the yogurt spheres that I posted about here a while back made using an Alginate bath. In this case, instead of loosening the Labneh (Greek-style strained yogurt) too much, I left it fairly thick and seasoned it lightly with salt. Due to the thick consistency, the yogurt does not form perfect loose spheres, instead it makes nice slightly misshapen dollops when the skin forms around it. When plated the yogurt looks a lot like a dumpling and gently oozes a thick sauce when the skin is pierced. It was a very cool use for the of the spherification process and worked great in taste, texture and look. About two or three weeks before this dinner I dehydrated red bell peppers and tomatoes. I knew I would be using them for something and this seemed fitting. To do that, I thinly sliced the fruit on a mandolin and laid them on parchment covered baking sheets. 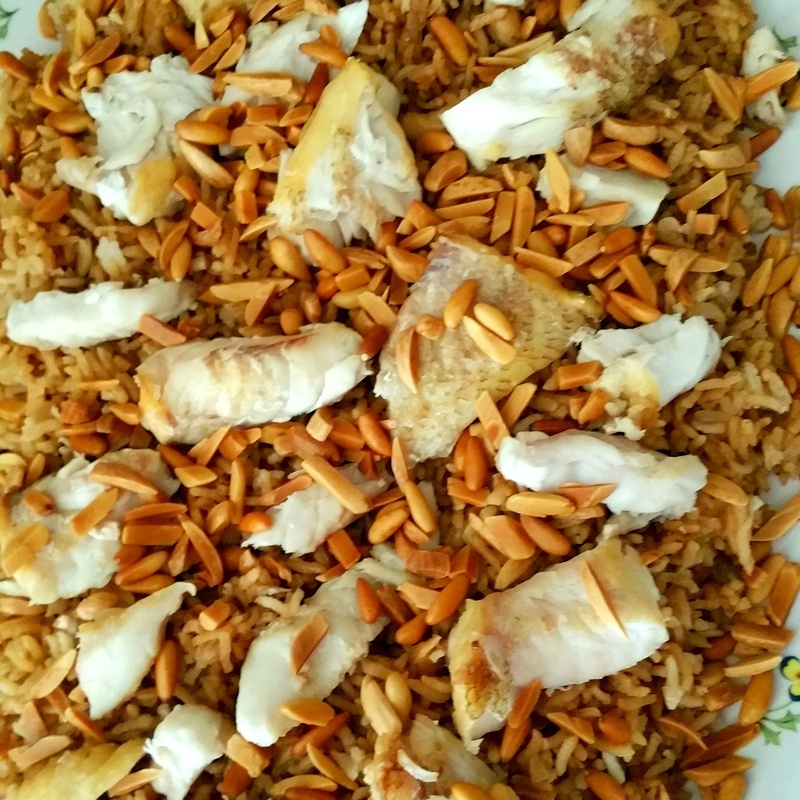 I seasoned them with a touch of salt and ground coriander seeds. they dried in a very low oven (around 165F) for about 12 hours until they turned crispy. They looked very neat and had a delicious concentrated flavor. Stored in an air-tight container with a disicator packet they came out perfectly crisp still and probably would’ve lasted a few more weeks. 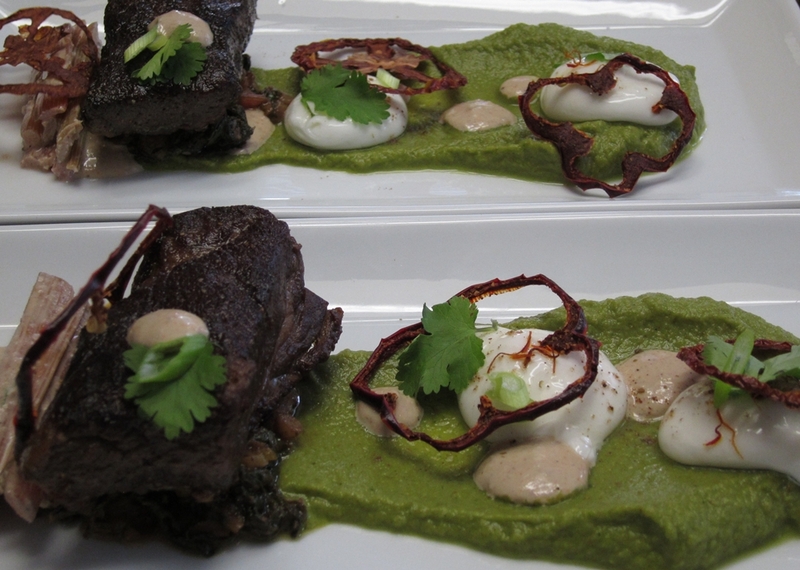 To plate the dish, I spread some of the eggplant puree on the rectangular plates with the spiced short rib on one end along with some of the sauced chard ribs. I used the chard ragout as a base for the short ribs and placed a couple of yogurt dumplings on top of the eggplant puree. These were seasoned with a bit of the spice mix and a few strands of saffron. 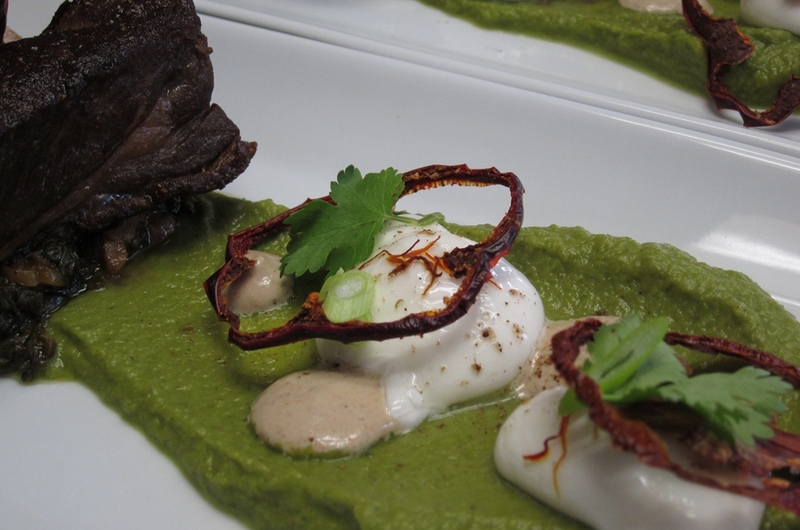 Some of the tahini-walnut sauce also went on the eggplant in the form of small dollops from a squeeze bottle and on the short rib to act as anchor for a little garnish of cilantro leaf and scallion rings. 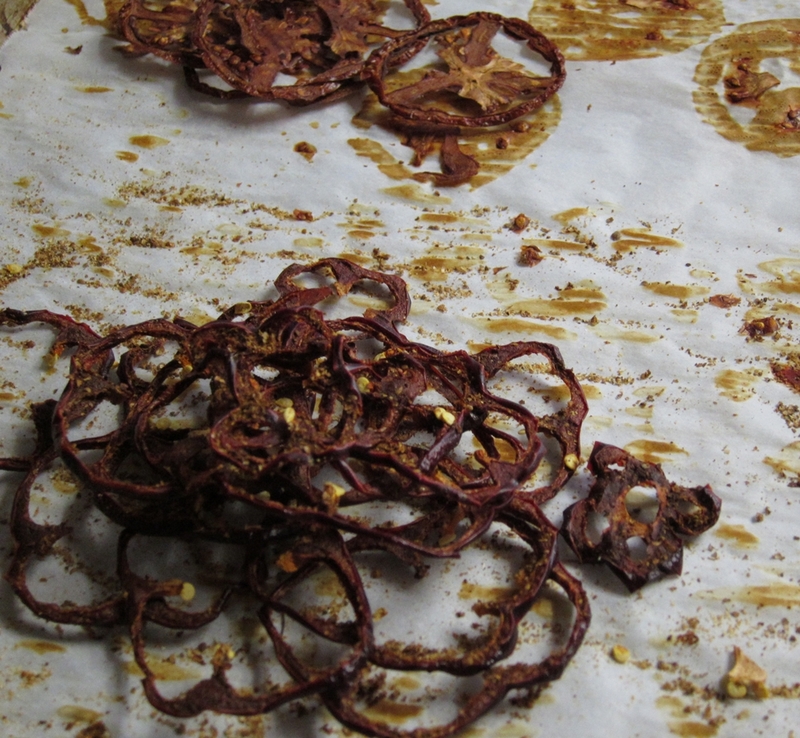 The last garnish was a couple of “rings” of the dehydrated red bell pepper and tomato.